I was at SM Marikina the other day and was looking for a place to have lunch. Since it was already past 2pm, I figured I'd visit the food court which was totally deserted. After making a quick round, I decided to try Pinoy Toppings for their relatively inexpensive meals and huge servings. 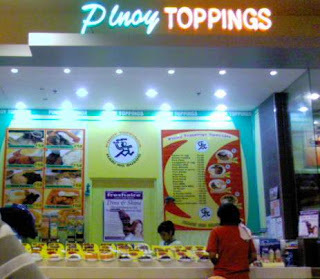 The last time I ate at Pinoy Toppings was years ago. I remember the huge mounds of rice they serve. And guess what ? It hasn't changed a bit. 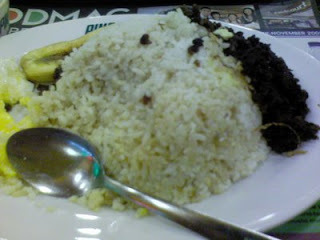 I ordered Tapsilog and I was still surprised (even if I antipicated it) to see a very generous serving of rice on a huge plate. It looked like more than 3 cups of rice. I don't think they use ordinary cups for measuring it but instead use bowls. I took a photo of my meal and take note that the spoon there is a tablespoon but looks like a minute teaspoon when placed beside the rice. Needless to say, I could barely finish half of the rice serving. If you have a craving for something close to unlimited rice, I suggest you check out Pinoy Toppings.